Lee Zlotoff talks about how his MacGyver Method works to engage the enormous capabilities of the subconscious mind to bear on effective problem solving as well as discussing his hit TV show and why it’s remained on air across the world for 30 years. Part 5 – Who You Gonna Call? If you recall from the last installment, I had just managed to navigate the Scylla and Charybdis of Henry Winkler and his alter ego, The Fonz, to be faced with concocting a suitable alternative to the ‘Hourglass’ concept that preserved the notion of a single-lead, action/adventure series. Piece of cake, you’re thinking, right? And I’d like to report that, having repaired to my office in Santa Monica, I cogitated for a brief period and—in a stunning epiphany—the concept of MacGyver in all his inimitable details simply sprang full-blown into my fertile mind. That’s what I’d like to report, but no such luck I’m afraid because it took a good deal more than that for Mac to enter the world. 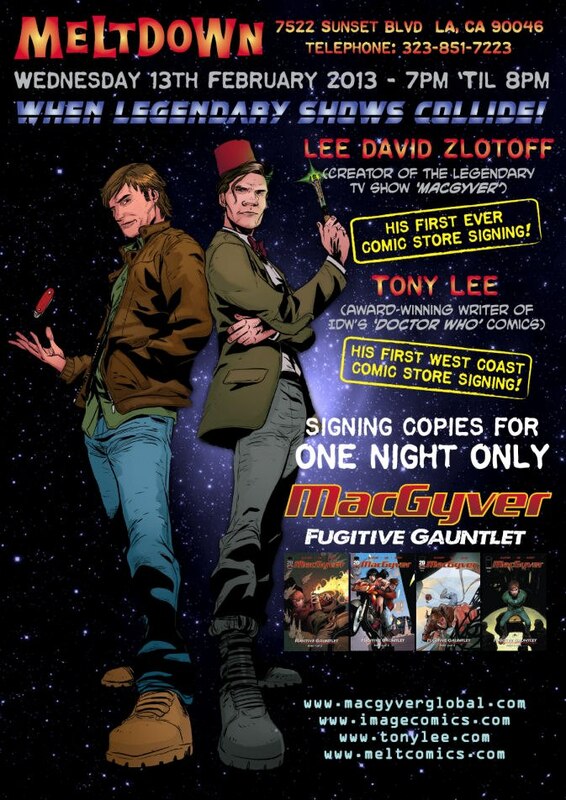 MacGyver creator Lee David Zlotoff and Comic book writer Tony Lee will both be in-store to meet fans and do signings on Feb 13 between 7-8pm at Meltdown comics. So if you’re in the LA area stop by and say Hi to them both. The finished poster for the MacGyver signing at Meltdown comics! Art by Andie Tong, colours by Ciaran Lucas!